Companies that fall between large corporations and small businesses are often fighting a continual see-saw battle. Small companies are able adjust quickly with far fewer employees and pool their resources to specialize in an industry niche. Larger companies have larger budgets and bigger departments, allowing them to handle greater diversity in project scopes and move with power in their industries. 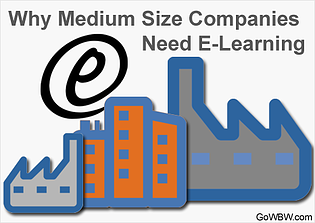 Learn how E-Learning can provide solutions to help the mid-size company stay competitive and improve their current productivity rates.